Given the industrial legacy of the site (former haulage yard) a desk study report was required to support the application for the erection of a number of dwellings in order to demonstrate the site could be made ‘suitable for use’ and could not be determined as being contaminated land under Part IIA (requirements of the National Policy Planning Framework). As part of the desk based part of the report the historical O.S maps were reviewed, which indicted that the site formed part of an orchard in the 1970’s and the site was redeveloped circa 1983. Aerial plates and Streeview imaged were also reviewed and did not provide any further information. The review of the surrounds of the site (within 250m for in-filled land) did not identify any potential off site sources of contamination. Environmental data and information held by the Environment Agency revealed a pump house and a smithy in close proximity to the site. O nce the desk based sections were complete a site reconnaissance (site walkover) survey was undertaken, which revealed that the northern area of the site had been used as a haulage depot and the southern half was a lawn fenced off from the remainder of the site. The infrastructure of a former above ground tank was identified on the northern area of the site. 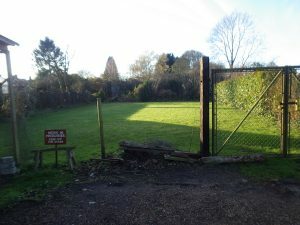 As part of the qualitative risk assessment, the smithy and ump house were discounted as credible sources of contamination, and whilst orchards have the potential to impact soils due to the use of lead arsenate pesticide, as the orchard was not present until the 1970’s this was also discounted as a credible source. Given the potential for the haulage depot to have impacted on site soils and the potential for made ground to be present, further intrusive works and remedial measures were proposed. Intuitive works were also proposed to investigate the area of the former tank as well as a limited investigation to determine if the site poses a risk to the underlying alluvium and principal chalk aquifer. The desk study report is presented with other application documents as well the memo from the contaminated land officer accepting the proposals for further works, which can be accessed here.